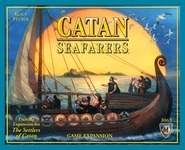 Description: This is an expansion for The Settlers of Catan. Players can build shipping lanes, which are very similar to roads. Additionally, the game comes with many different water-hex-heavy variant setups. The American version (Mayfair) should only be used with the American base game, instead of the German one (Kosmos), because of matching components and for the same reason, the Kosmos German version should only be used with the German base game. Additionally, several different editions exist; 4th edition is the most recent. Editions should only be used with same edition, otherwise the purchase of adapter kit is required.